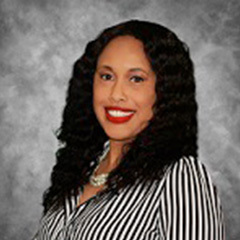 Enika McClain is an Advanced Practice Registered Nurse, who is also certified as a Family Nurse Practitioner. Enika has over 17 years of nursing experience as a Licensed Practice and Registered Nurse, She has worked in a variety of settings, including Behavioral Health, Oncology, Orthopedics, Cardiology, Medical Surgical, Emergency, Pediatrics, Women's Health, and Infusion. As a Family Nurse Practitioner, Enika has experience in primary care. Enika is certified by the American Academy of Nurse Practitioners (AANP). She joined Georgia Behavioral Health Professionals in February 2018. She was raised in Albany, GA and attended Albany State University where she received a Bachelor of Science in Nursing. She furthered her education by attaining a Master of Science degree in Nursing (Family Nurse Practitioner) from South University where she graduated with the highest honors. Enika is a proud member of the Sigma Theta Tau International Nursing Honor Society. Enika believes in delivering the best quality of care by providing compassionate, culturally, diverse, and patient centered care.